In my practice, I hear many couples say, ” I just want my partner to understand me. Who wouldn't want that? You tell your partner things, they truly get what you say and you feel understood. And vice versa: your partner shares their deepest feelings and thoughts with you, you receive what they say, and everyone in the end feels understood – and loved. It doesn't always work that way though, does it? In my practice I’ve noticed many reasons why couples don't feel they have the understanding relationship that they desire. Or, why they don't feel as understood as they wish they did. I have also found a powerful shift in thinking that can change this. One partner does not have to agree with what the other is saying. Think about it. You probably disagree with some things your partner says. You are two different people, so you won't always see things the same way. That is not the problem. The problem is what you do with that difference. Partner B: Oh? I didn't mean it to come across that way (representing Partner A’s truth). Why did it feel that way to you? (eliciting Partner A's truth, and then holding it without defensiveness). Here’s the bottom line. Your goal should be to represent your point of view, but to make room and hold your partner's point of view as well, even when you don't agree with it. This takes practice, skill, effort and motivation. In return, you and your partner can reap some prolific rewards. Learn to create and sustain a loving and understanding relationship with your partner. 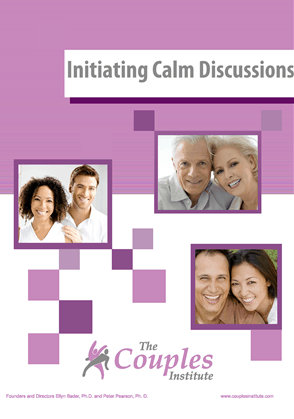 Join Michelle Joy, MFT, for the next Couples Communication Workshop on Saturday, August 26. Space is limited! Michelle Wangler Joy, MFT, has been employed at The Couples Institute in Menlo Park, CA, since 2002, and is currently a therapist on staff. She trains with relationship experts Ellyn Bader, Ph.D and Peter Pearson, Ph.D to deliver state of the art tools for couples. Michelle provides both couples and individual counseling, teaches communication workshops, and conducts training seminars both locally and nationally for therapists on how to help more couples.